Prep time is 3 minutes, so this is a GREAT dish for company. 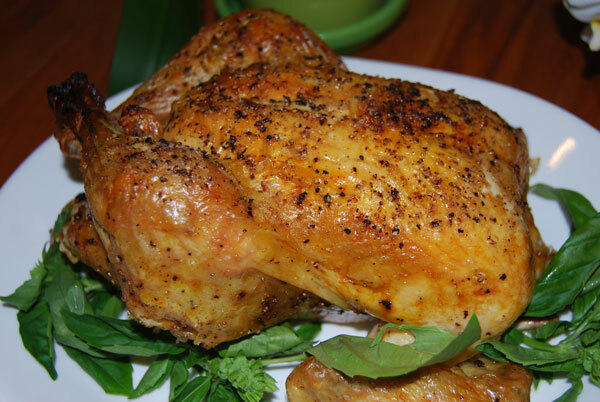 Buy whole chickens on sale for half the price of a store bought rotisserie chicken. Rinse the chicken and quickly pat dry with paper towel. Freeze the innards to make stock later if desired. Tie the feet together with cotton string. Drizzle the entire chicken with olive oil, and salt/pepper front and backside. Using Kosher salt and cracked pepper is important if you are a skin eater ! Place in roasting pan breast side up, and tuck wings underneath the body. Cook at 400 F for one hour. Don’t baste, and don’t open the oven. The USDA recommends an internal temp of 165 F, and I have found one hour is perfect for a medium sized chicken. Take the chicken out and let it rest for 10-15 min. before cutting. Don’t worry it won’t get cold, resting is important to let the juices settle into the meat.